Roaring Brook Press, 9781250140913, 32pp. 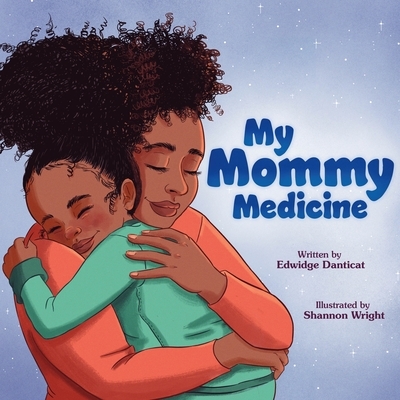 My Mommy Medicine is a picture book about the comfort and love a mama offers when her child isn't feeling well, from renowned author Edwidge Danticat. I can always count on my Mommy Medicine. When a child wakes up feeling sick, she is treated to a good dose of Mommy Medicine. Her remedy includes a yummy cup of hot chocolate; a cozy, bubble-filled bath time; and unlimited snuggles and cuddles. Mommy Medicine can heal all woes and make any day the BEST day! Award-winning memoirist Edwidge Danticat's rich and lyrical text envelops the reader in the security of a mother's love, and debut artist Shannon Wright's vibrant art infuses the story with even more warmth. Edwidge Danticat is the author of several books, including Breath, Eyes, Memory, an Oprah's Book Club selection; Krik? Krak!, a National Book Award finalist; The Farming of Bones, an American Book Award winner; and the novel-in-stories, The Dew Breaker. She is the editor of The Butterfly’s Way: Voices from the Haitian Diaspora in the United States and The Beacon Best of 2000: Great Writing by Men and Women of All Colors and Cultures, Haiti Noir and Haiti Noir 2, and Best American Essays 2011. She has written several books for young adults and children—Anacaona, Behind the Mountains, Eight Days, The Last Mapou, Mama's Nightingale, and Untwine—as well as a travel narrative, After the Dance, A Walk Through Carnival in Jacmel. Her memoir, Brother, I’m Dying, was a 2007 finalist for the National Book Award and a 2008 winner of the National Book Critics Circle Award for autobiography. She is a 2009 MacArthur Fellow. Shannon Wright is an illustrator and cartoonist reading fanfiction in Richmond, Virginia. Her work has appeared in The New York Times, Time magazine, Mother Jones, Google and KaBOOM! Studios. She is the illustrator of Twins, a graphic novel by Varian Johnson. Shannon also teaches a comics course at Virginia Commonwealth University. My Mommy Medicine is her first picture book.